Drum roll please… Word of mouth! Not what you expected? Think about it this way: no one shows up to an event all by themselves. They always show up with their roommates or a group of friends. They didn’t just magically appear at your event! Students heard about it, talked about it and planned on attending. This is where my booklet comes into play. Interesting and creative advertising techniques will get your fellow students to take notice. Utilizing these promotional ideas will engage your campus in conversation—specifically, about YOUR event. Once they start talking, you’ve done your job. With the right advertising and memorable events, you’ll have students coming back for every event to follow! FREE FOOD. Need I say more? Now that you have bigger posters, use them! Laminate a few, staple them to a post and stick them along walking paths. Boom! You’ll have instant and unique signage that students will notice. Spend even a bit more on a big poster. I mean BIG—like length and width measured in feet, not inches. Hang it in a high traffic area like the dining hall or the entrance stairwell to the campus center. Go all out and hang a few of these super posters. They work best for events with lots of important info like a “Springfest.” For an ongoing series of events, you could always update this poster by taping a new info printout onto it. In an ideal world, there is some kind of poster that everyone on campus looks at. That poster would also be interchangeable for each event without additional costs. This does exist and it’s called a “Wind Sign Sidewalk Sign.” They sell really great indoor/outdoor ones that you can put along high traffic paths. All you do is change the info for each event by sliding the letters on and off like they do to a movie theatre marquee. If you don’t have the money, you could also build a Sandwich Board out of ply wood and add the letters separately or even just paint them yourself. A table tent is a tri-fold advertisement that stands on its own. Imagine folding a piece of paper perpendicular along the long side, forming a triangle. These are placed on tables in dining hall and cafes. Now everyone is looking at your information of the upcoming events during their meal. It is staring them in the face and curiosity will make them pick the tent up and turn it around to see all sides. Make sure they are all different! Not loving the work it takes to make table tents? Here is a quicker but slightly more expensive alternative: napkin dispensers with ad windows. Buy one for all the tables at the dining hall or better yet, split the cost with the hall. They dispense napkins and have a window on each side to fit a piece of paper, kind of like a picture frame. You can put a smaller version of your poster advertising upcoming events. Xpressnap Napkin Dispensers are perfect. They come in multiple sizes including the “Tabletop Dispenser.” This is what you want and it’s sold online $6-$8 each. Remember the organization running the dining hall (I’m guessing Sodexho) has to be on board with the change because they are the ones to maintain and ordering napkins. So, make some new friends! “Postering” or putting up posters all over campus is not a fun job but someone has to do it. The process can be improved. Once a year, walk the campus with some of your organization members and take inventory of all the best places to poster. For example, count how many bulletin boards are in an area. If you’ve done this once, you know exactly how many posters you need for the year’s events and where they are going. Now at your meetings you can assign your members with posters and specific locations based on your inventory. The campus will be evenly divided and covered and members are only responsible for a handful of posters at a time. Bonus: You’ll save money by printing up only what you need, no excess. Start really thinking about advertising usage. YOU can do what advertising agencies get paid thousands of dollars for! Focus your product (events) to specific demographics (groups of students) on campus. For Example: Doing an event for commuters? Poster the heck out of commuter lounges, the coffee shop and even the commuter parking lot. Find out if leaving leaflets under car wiper blades are ok on your campus. If not, use the POSTers technique there. Force students to reach out for your events, literally. Every time they put their hand out to a doorknob, they’re grabbing at your advertising! 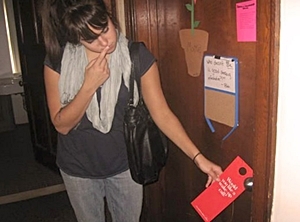 Make what’s called a “door-hanger” to bring the advertisements to residence halls. It’s a rectangle info sheet with a hook at the top to be hung from a doorknob. Google search “Door-hanger Template” for help on creating your own. A less involved method for advertising in res halls is simply sliding an event info sheet, or quarter sheet, under each dorm room door. A quarter sheet is just that—a single sheet of paper is printed with 4 smaller poster, in quarters, then cut. These sheets can be printed easily and used elsewhere such as handing them out in the Campus Center or dining hall. Real Story: After we started using chalk on campus all the other groups started to use it because it worked so well. Some people started using it to write on buildings, like graffiti. That coupled with drawing it in spots where the rain couldn’t safely wash it away meant that chalking eventually got banned. Moral of the story: Respect your campus and wash off the chalk when the event is over so no faculty or staff is upset. This idea comes from Northeast Iowa Community College. This is by far the coolest, funniest and most unique way to advertise on a campus that I have EVER encountered. It’s a simple printout of an activities calendar with a great gimmick to make people pay attention. Post these calendars in all the bathroom stalls in your campus center. Think about it—you have a captive audience, who’s not going anywhere, that will read this. And yes, title it Stall Street journal. Make sure not to put too much info, short and sweet, to peak their interest. You’ll also want to give a link to a site with all additional info, like your website, Facebook page etc. You have a calendar of events on your website and Facebook. UPDATE the darn thing! I’ve seen Activities board sites whose “upcoming” event is 2 years ago. Seriously guys? Really!? No one will ever come to you about information if it’s not even there. Get in the habit of updating it every time something changes or at least once a week. You should have one person responsible to do this task so it’s not forgotten. An email should be sent once a week outlining the week’s upcoming events. Now, we all hate getting tons of junk emails from companies right? Don’t be junking up your students’ email box. Instead keep the amount of emails to a minimum so when someone sees your name in their inbox they want to open it for the important info. Content should be clear, concise and recognizable. I’d suggest having a top banner for the email created by a graphic designer with your logo etc. Use it every time so every email looks like it came from you. There are plenty of mass email programs out there—for free—that will help you design nice emails and manage your contact lists. I use MailChimp, not only because it’s free, but their templates are great and you’re notified when your emails are opened and by whom. So this technically isn’t an advertising technique. It’s a free, awesome activity to add to your already existing events. It will however help you gather emails for your list to advertise in the future. Everyone enjoys getting their photo taken to remember an event. A photo booth is a great way to give a souvenir to students. Save yourselves some money and make your own booth! Set up a digital camera on a tripod with some kind of backdrop—a bed sheet or banner with your logo. Offer props to take photos with, relating to the theme of the event. You could have pennants and pompoms at a sports game, moustaches and ten gallon hats at country night or even have your mascot jump in! The catch: assure them you will email their pictures after the event and bam!—now you have their contact info. It may sound sneaky but you’re telling them upfront and you’ll only email their photo and occasional event updates. All you need is their name and email on a signup sheet. Be sure you notate the camera’s photo number with each student’s info. Caution: this takes work! You MUST email everyone their pics and in a timely manner. You don’t want your students to lose trust in your organization. With all this hard work, you are cleverly building up an email list of current, interested students to email blast! The return is totally worth the work you put in. You should have what I call an “Advertising Roll-Out Plan” in place for events. It’s basically a breakdown of advertising strategies for each event for the upcoming year. Each event chair can create their own promotional plans and work with the advertising chair, if one exists. If you don’t have a plan, I guarantee something will be forgotten. You’ll wind up rushing around last minute begging the printers for help ASAP. Don’t worry…it’s happened to the best of us. Have shirts printed up for all your active members. Include your recognizable logo on the front and have, “Ask me about Tonight’s Event” on the back. Everyone should wear their shirts on event days. Imagine a sea of orange Student Activities members in classrooms and at dinner. Your group becomes walking advertisement! Best of all, you will get asked about the event and get people talking without even trying. Bonus: You are creating unity with your group while sparking interest for your event. Have some custom balloons printed up with your logo on one side and “Event Tonight!” on the other. Place them around campus on your way to your first class or lunch on event day. Since it’s a generic enough balloon, you can make one huge order and use them for any event. Bonus: Your campus will learn over time what your balloons mean: there’s an awesome event tonight! Wonder how you can get your posters right in your students’ faces? I’ve got your answer! I learned this strategy by prop comedian, Marty Putz. Just like his show, this advertising strategy is brilliant. 1. First, print some smaller posters/info sheets, about the size of a birthday card, with only basic info. 2. Glue 2 of these sheets back to back with cardstock or construction paper between, to keep it rigid. 3. Inflate some balloons with helium and tie some ribbon to them. Make the ribbon long enough to reach the ceiling, cutting it off at eye level. 4. Attach the mini-posters to the bottom of the balloon ribbon. 5. Release your dangling balloon advertisements in a high traffic area and no one will miss them! Note: The balloon dangle is best used on the day of an event with signs saying “Tonight!” It’s perfect for food locations, lounges and even resident halls. They’re exceptional in high traffic hallways. I love this advertising method because it has a life of its own. Keep in mind the balloons will move around the space as people walk. 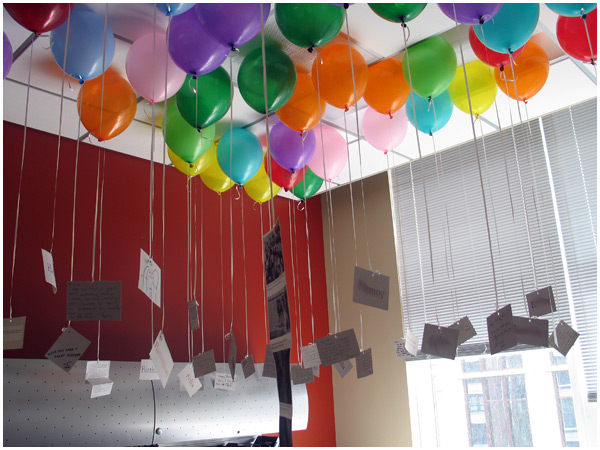 It’s even better if the balloons get moved around or taken by students—that’s half the fun! The message of your event will come across as a fun, must go-to party. A balloon arch is just an archway made of balloons. Seems simple enough in concept. We’ve all seen them at special events or watched athletes run through one. They are pricy to buy from a party store. I recommend you just do-it-yourself before your next big event. It will take some time but can be done at a fraction of the price. Just Google “Balloon Arch” and there are even kits and free how to videos. Why not!? How cool is walking through one of these to set the mood at an event? Put out a balloon arch in the morning of an event, outside the room or auditorium doors. All day people will pass by thinking about attending your event later. Don’t forget a poster on the doors so people can get all the info too. Sure, coupons are great to save money, especially as a college student. I challenge you to actually think about them in a different way. Coupons are a piece of paper brought into a store to get something at a discount or even free. Who doesn’t love free stuff?! Use this to your advantage! Offer a coupon deal for your next event. Reward those who arrived early to an event with a coupon and tell them to claim their prize at your next event. The coupon should outline what the prize is and when/where they can claim it. You’re now assuring that these students will be at your next event. This is similar to a coupon but should be used for raffling off a bigger prize for one person, not claimed by many. Give everyone a ticket at the door for the big prize you will be giving away at your next event. Have all the info for your next event on one side and a raffle number on the other. You’ll pull the lucky number at the start of the next event. Everyone will get excited for the drawing and those not involved will be jealous! After you give the give awayyour prize, offer another ticket at the event’s end to bring students back for yet another prize. You will have a cycle of people coming to your events, staying till the end and all over again! - Slap them on gifts and giveaways. Now every time the student looks at their new iPad, they will remember winning it from your organization. - Need a bag or box to give away gifts? Boom! Now it’s a Campus Activities swag bag! - Use them as a “property of” to put on the side of all your stuff. Now your office chairs or projector won’t be confused for other organizations’. It’s a powerful advantage to be able to make your own stickers. Printer labels make that an easy possibility. You can print smaller batches instead of ordering a few hundred. It’s a customizable sticker on the fly. Slap them on candy, bubbles, decks of cards and more. 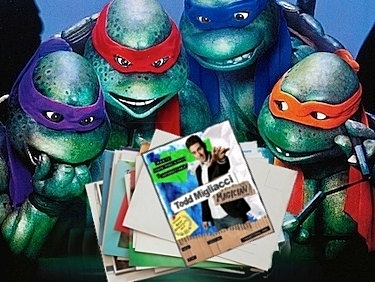 -You can even fix mistakes on already printed items instead of spending more money to reprint promo materials. They make all sizes and now even different shaped labels. They offer everything from small badge like circles to large rectangles specifically to wrap water bottles. They all fit in a normal printer and can be printed in black and white or color. Toy stores are full of thing you can blow up. Not blow up like explode… although that would get some attention as well. I’m talking about inflatables. Pool toys are a perfect example—beach balls, alligators, fish etc. You can get an inflatable to use on campus for advertising a specific event’s theme. -Big Basketballs for the local sports games. Nothing like an inflatable field goal post in the middle of the cafeteria with a poster stuck on it to get noticed. -Other seasonal offerings like Halloween ghosts for a haunted house event or at Christmas, Santas or penguins to advertise holiday ice skating. You could even invest in a “Wacky Waving Inflatable Arm Flailing Tube Man” customized with your logo and name on it. Frequent Shopper Cards are set up to earn points for your loyalty to a specific business. Like that coffee shop that offers a free 10th coffee after you buy 9. You can do the same thing and reward your fellow students for being involved on campus and coming to your organization’s events. You could offer a few different options. Most punches throughout the semester could get a huge prize at the end. Maybe every 7 events attended the student gets to choose a sweet prize like $30 gift certificate to the school store or to local hot-spot restaurant. Side Note: You are getting these types of gifts donated or splitting the costs, right? On the same idea of Frequent Shopper Cards, why not reward the students who don’t miss an event? Give them the Student Activities V.I.P. experience. Make up individual V.I.P. Club Cards at each event. It may take you 5 minutes of work per event but over time, people will find out and desperately want to be a part of your V.I.P. club. 1. Save money by shopping in bulk at Sams Club or BJ’s. Become a member of the one near you and buy in bulk all year long for just a yearly fee. From candy to water bottles, even full popcorn and cotton candy machines can be purchased here. If you want to save more money, find a fellow student of your organization who is a member or has access to their parents’ membership. Shop with them to use their club card but pay with your organization credit card. Don’t forget to let them pick something out as a thank you! 2. You can use giveaways/prizes to attract new students, rewarding current members, or for a Greedy Bingo game. When selecting items, think about what is practical and what is fun. Ask yourself what you’d want in any given scenario. Asking specific questions will help you find better solutions. For example, “What candy would you like to eat at a comedy show?” Or, “What prize would you want to win during finals week?” My answers are Laffy Taffy and a relaxing spa day. Yours may vary so ask your friends and fellow students! If an event is dirt cheap, why not be like Nike and “Just Do It!” Throw tons of mini-sized events throughout the year. You already have conference rooms pimped out with great tech equipment that doesn’t get used after 5pm. Have Disney Movie Tuesdays where everyone attending votes for the next film shown—they’ll be more likely to come back if they are involved with decisions. Involve students who normally wouldn’t be involved with a gaming night like a Mario Kart Tournament. It only costs you $10 for posters and the time it takes to sign out the room. Don’t burn bridges. Don’t lose a single student. You need to be able to work with other organizations. Burn a bridge and you might not be able to ask for that favor you’ll need. Moral of the story: Don’t shoot down anyone. Especially the dreamers. 1. You will lose good people working for/with you. 2. You won’t lose just that one person, but most likely their entire group of friends will be turned off from your events. 3. Say goodbye to the possibility of new and unique ideas that will bring people to your organization and events. What better way to hear what your target audience wants then to ask them? Everyone in your student body has opinions but let’s be honest, very few will show up to meetings and tell you. When they attend one of your events, whether it be for the specific celebrity or free food, ask what will make them come back. Read what they write on your survey card. It may not be what you want to hear but it’s the voice of the people. Maybe they want more magicians or just better topping selections for your free Sundae Sunday Event. Note: Put your ego aside. The comments are people’s opinions. No comment is a bad one. You can turn even disappointing comments into positive ones. You might hear they ONLY came to the event for free pizza. What I hear? People will come to every event we serve pizza at, no matter what… so we’re having pizza at more events! Reward everyone that fills out a card with a small prize or a raffle. This makes sure each card is sincere and not a joke because they can’t be anonymous. Bonus: Have them fill out basic info like name, email etc. Make the rest a check box section to get info like school year, resident/commuter, major etc. Now you have their email for your mailing list and you’re learning what types of students like which events. It’s important to get opinions from within your organization. To do this, set up a comment box for your active members in or just outside your office. Encourage its use and ask for anonymous comments and ideas. You’ll gather so many more great ideas this way. However, there’s an alternate motive for the comment box. Most of the time, people just want to get something off their chest and this is a healthy way of doing so. When everyone gets heard on a small level, you now can avoid stupid office drama and staff bickering. Everyone is now working better as a team because the little things don’t blow up. Avoid this backfiring by constantly maintaining and addressing the comments in the box. No one gets offended and no one can say that the comments “don’t matter “(when they really mean that they themselves don’t matter.) When your whole group stops sweating the small stuff, you focus on the big picture and getting more done.